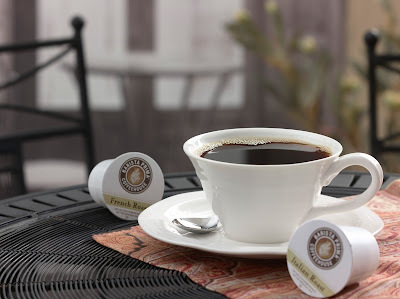 I am a huge fan of Green Mountain coffee so when I heard they were part of this new flavor of Keurig k-kups called Barista Prima Coffeehouse I was really eager to try them. The wonderful folks at Green Mountain sent me a great gift set which included all four flavors...Columbia, House Blend, Italian Roast and French Roast. It also included 2 biscotti to dunk with my coffee !! I am not a huge fan of very strong coffee but this was really wonderful. I put my coffee mate creamer in italian sweet cream and some sugar and well, I was as happy as I could be !! For those who love strong coffee, this is a great choice but even if not, with the right amount of cream/milk and sugar ...it is really delish! This new brand of k-cup is to remind you of sitting in a cafe in Europe drinking a cup of coffee and enjoying the experience. I also love the flavors for the Keurig of Donut House collection, Wild Mountain Blueberry (great iced), Caramel Vanilla and Mocha Nut Fudge.....we really enjoy our machine at home and the many flavor selections available out there!! Be sure to also check out their Facebook page for giveaways HERE. FTC Disclosure: **I was provided with the Barista Prima Coffeehouse Collection product mentioned in this post free of charge. I did not receive any monetary compensation for this post & was not obligated to give a positive review of the product. All opinions expressed here are mine. ** Photos provided by Green Mountain Coffee for this post.